You are here: Home / How To Get Rid Of.. / How To Get Rid Of A Stye? If you are wondering how to get rid of a Stye naturally without relying on antibiotic ointments alone, you can use some natural cures, use of warm compresses being the most common. An Eye Stye or Eye Sty may develop due to infected hair follicle at the base of an eyelash or due to infection of blocked oil glands within the eyelid. Styes can form on the outside or inside of eyelids as small red bumps with whitish or yellowish center due to pus. The condition is accompanied by symptoms like pain, inflammation, watering of eyes and discomfort while blinking due to gritty sensation as if there is some foreign matter in the eye. These pimple-like lumps on eyes usually appear one at a time but appearance of more than one Styes on either or both the eyes is not uncommon. Internal Styes tend to be more painful than the external ones. Factors like Stress, Diabetes, Chronic Blepharitis (inflammation on edge of eyelid) and certain other chronic diseases increase the likelihood of developing Eye Styes. The condition (medically known as Hordeolum) usually takes about a week to heal. It is mostly caused by Staphylococcus aureus bacterium. Though painful and uncomfortable still, a Stye in your eye is not likely to cause damage to your eye. • Keeping a warm compress on eye is the most highly recommended home remedy to cure a Stye naturally. You could use a soft face towel soaked in warm water for this purpose. Follow this therapy 4-6 times in a day for 5-10 minutes at a time. Do not attempt to squeeze the lump yourself as it can spread the infection. • Placing warm and damp herbal tea bag (like that of chamomile and red raspberry leaf) on the infected eye can also help you get rid of a Stye. • Boil a teaspoon of coriander seeds in a cup of water and wash the eyes with this solution when it is bearably hot. Follow this simple Stye home treatment 3-4 times in a day. • Acacia leaves are highly beneficial in getting rid of a Stye on eye. To follow this remedy, boil a handful of acacia leaves in two cups of water. Strain the solution and soak a cloth or face towel in it. Finally, place on the affected eye to reduce a Stye and its inflammation. • In case the condition is accompanied by swelling and puffiness, use a compress prepared by adding a tablespoon of crushed nasturtium seed in a tablespoon of grated potato on affected eye to provide relief. A poultice simply prepared from grated potatoes can also be used to soothe the eyes. • Warm some guava leaves slightly and place them on a moist and warm soft face towel. Use this as a compress to heal a Stye. But, how do you get rid of a Stye with guava leaves? Actually, guava leaves tend to reduce the pain, redness and swelling associated with this problem. So, you are not likely to touch the eye again and again when the discomfort is gone, thereby allowing the body to heal the infection fast. 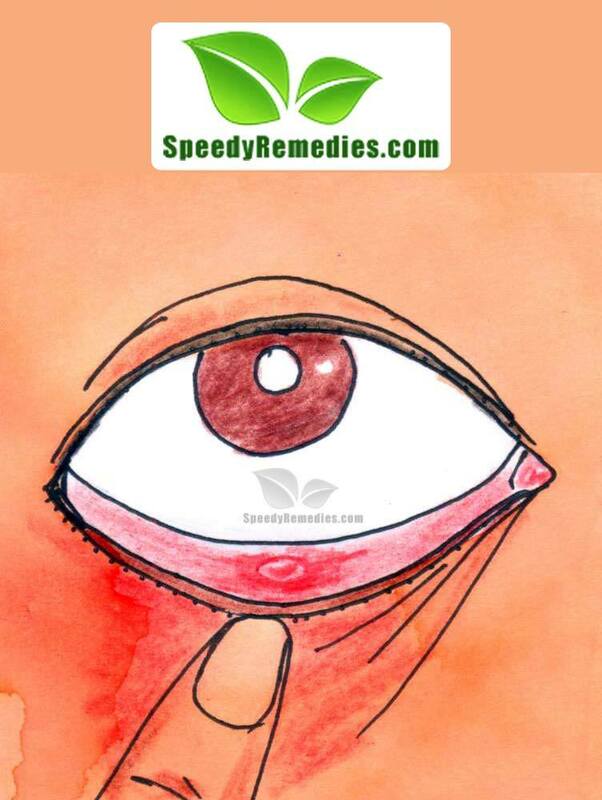 • To control Stye infection in eye, use a solution of turmeric powder and water. To prepare this decoction, boil a teaspoon of turmeric powder in two cups of water and strain it when the quantity of water reduces to half. Make sure there are no granules left. Finally, use this natural antibiotic home medicine as eye drops to treat this irritating eye problem.Here’s a video explaining how to treat a Stye. • Boil sufficient parsley leaves in a cup of water for 10 minutes and strain the solution. Soak a cloth in this solution when it is bearably warm and place it on eyes, especially around eyelids for about 15 minutes to relieve eye discomfort caused by a Stye. • When dealing with a Stye, avoid wearing eye makeup resist the temptation of rubbing your eyes persistently. Plus, avoid wearing contact lenses until your Sty heals. Besides, start the home treatment as soon as you experience initial signs of a Stye to reduce its severity. Wash your hands thoroughly before and after applying any of the topical Stye medications or compresses. • Homeopathic medicines like Pulsatilla, Staphagria, Silicea Terra etc can help dissolve and remove recurrent Styes. Seek advice from an expert about the medicine and dosage most suitable for you. Apart from adopting these measures on how to get rid of a Stye, maintain proper eye hygiene by keeping the skin on eyelids clean and by removing crusting and stickiness around the eyes. Surgical drainage may be requires in case the condition becomes severe.